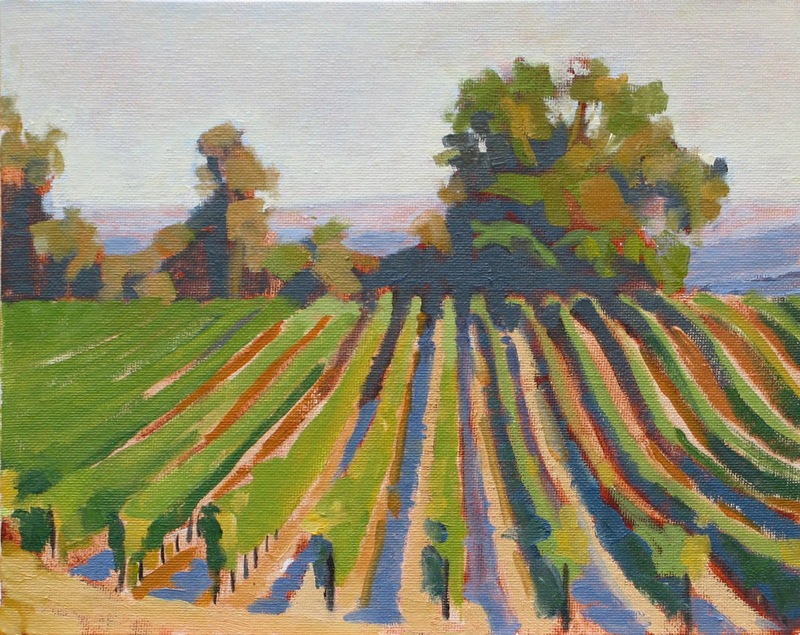 The rows of pinot grapevines at Williams Seleym Vineyards in the Russian River Valley were the subject for this painting. See this painting in the "Art on the Green" show at Viewpoints Gallery in August. 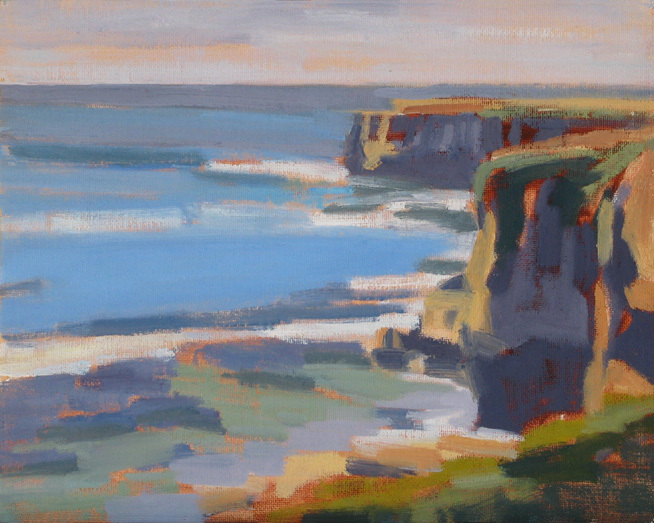 I was painting in Santa Cruz the other day, on West Cliff Drive near the Santa Cruz Surfing Museum and lighthouse. I chose another view but took a photo of Steamer Lane, a famous surfing spot in Santa Cruz. Steamer Lane has consistent surf and two distinct beautiful waves, add to that a warm, sunny day and there were plenty of surfers in the water. I chose this composition because of the cast shadows on the cliffs created by the angle of the sun. It is a long drop down from the cliffs to the ocean where the rocky bottom contrasts with the shallow greenish water. About ten of my Southern California paintings are in a show called "Staycation" through August 13 at the Red Brick Gallery, 315 E Main St, Ventura. 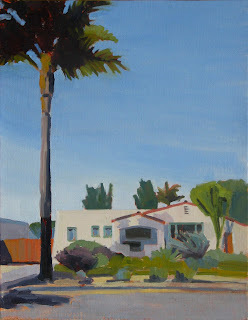 I've painted many townscapes and bungalows in Ventura and Chrisman Avenue is one of my favorite streets. The small Spanish style bungalows in Southern California and the unique landscape plantings of palms, cycads, and cactus, always capture my attention. In this particular painting I like the shadow of the palm tree on the house and the dark underside of the queen palm tree canopy. Stop by Viewpoints Gallery in Los Altos to see my latest work. The photo above shows the exhibit of my artwork for the month of July. You can see cityscapes of San Francisco, surfers, sailboats and even a landscape of Ojai. 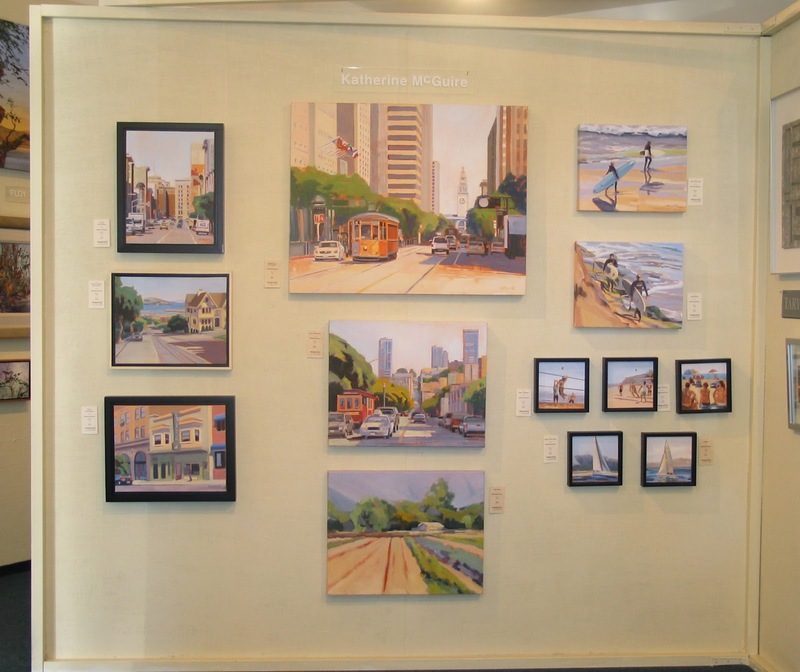 Viewpoints Gallery is located at 315 State St, Los Altos and is open seven days a week, Mon-Sat 11-5 and Sun 11-3.